With news that New England tight end Rob Gronkowski probably is out for the rest of the season, it’s tempting to say the 9-2 Patriots will remain dominant over their remaining regular-season games and into the playoffs. After all, they did just fine without superstar 39-year-old quarterback Tom Brady for the first four games of this season. Surely they can do without one seam-runner, right? Honestly, I’m not sure. While keeping in mind that football is an enigma, and that anyone who says they can tell you exactly how much any player is worth is either foolish or selling something, there’s a fairly strong case that “Gronk” is incredibly valuable to Brady and the Pats — more so than we might guess at first blush. Let’s step back for a second. From 2001 to 2006, Brady averaged 25 touchdowns per season (with a high of 28) and averaged 13 interceptions (with a low of 12).1 In 2007, he basically doubled his production by throwing 50 TDs, with just eight INTs. While those numbers were MVP-caliber gaudiness, they were fairly easy to ascribe to the arrival of one Randy Gene Moss, who had already demonstrated his otherworldly capacity to make QBs look amazing with the likes of Jeff George, Randall Cunningham and Daunte Culpepper. But the most shocking and mysterious period of Brady’s career may have begun in 2010, when — after Moss was bizarrely shipped to the Vikings with a seventh-round pick in exchange for a third-round pick after four games — Brady threw 27 TDs and just 2 INTs over the back 12. At the time, much of the credit for that was given to Wes Welker, the other star receiver brought to New England for that 2007 season. But that impressive stretch by Brady also included eight TDs (after two in the first four weeks) thrown to 6-foot-6-inch then-rookie tight end Gronkowski. And after that Moss trade cost Brady the ability to throw to what may have been one of the best, if not the best, wide receivers of all time, Brady has continued to flourish in the Patriots’ wide-open offense — in which Gronk has been heavily featured. Maybe Brady’s remarkably strong performance sans Moss isn’t so remarkable: Maybe Gronk is just so good that he has taken Moss’s place as the quarterback-maker du jour. To get a sense of Gronkowski’s impact, I did a little “with or without you”-style analysis of pairings between QBs and wide receivers or tight ends since 2006. This looks at how a pass-catcher being in the lineup or not affected his QB’s performance in both yards per attempt (which corresponds roughly to how explosive an offense is) and points above replacement (meaning how efficient the QB’s offense is relative to expectations for all the situations it finds itself in). So, Gronk is at the top of the pack in terms of observed impact. Note — and I can’t stress this enough — that these are incredibly high-variance comparisons and shouldn’t be taken as definitive about any player. (Moss had a fairly similar observed impact with eight different quarterbacks — and we still kept our conclusions at least a little tentative.) 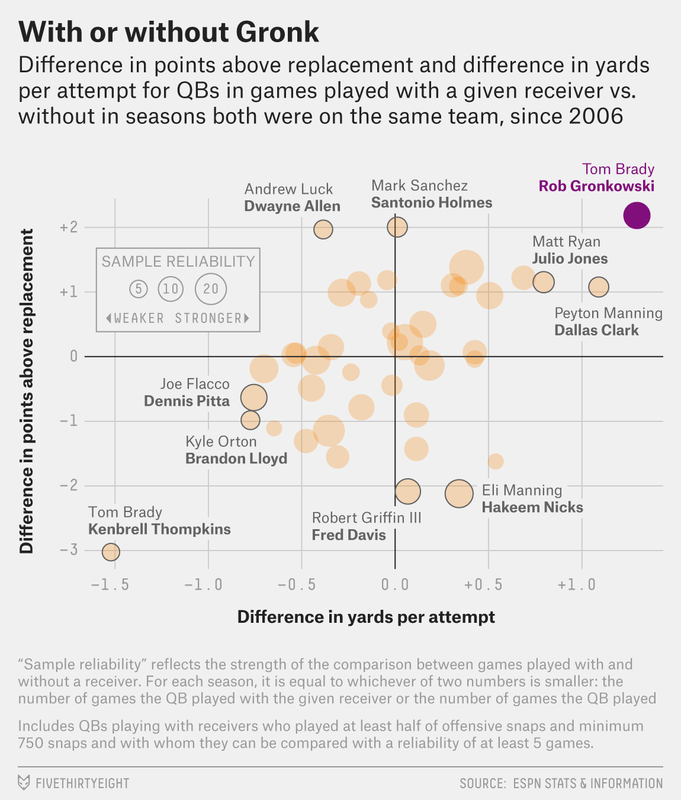 But coupled with Gronkowski’s production on paper, his effect on Brady’s stats makes a strong case that the Patriots aren’t just using Gronkowski, they’re relying on him. While he may never have as convincing a data set as Moss did (having so much impact over so many stints with so many quarterbacks is unique in NFL history), he appears to be on that track. Which is unfortunate news for Patriots fans, at least for now. But in the long run, any evidence that the Patriots’ stellar passing game isn’t going to retire anytime soon should be welcome. To go with his 0.5 yearly Super Bowl wins, naturally.